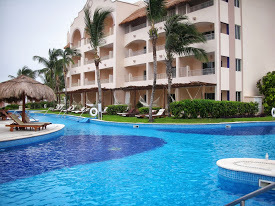 Is Excellence Riviera Cancun “Adult Only” All Inclusive A Good Choice For A Honeymoon? With all the great choices for an all inclusive honeymoon or special anniversary trip in Mexico and the Caribbean, I always get asked which one is the best. If Excellence Riviera Maya has caught your eye and you are wondering if it is a good choice for you, I might be able to help you decide. If you are looking for a medium to large size “adult only” all inclusive property, Excellence Riviera Cancun has approximately 348 suites (they will be adding more two story terrace suites and junior suites in the near future) and the property has a nice variety of room options from their standard junior suites, to swim up suites and the very popular two story terrace suites. All the rooms are nice and feature a whirlpool bath which seems to be on most couple’s wishlist. If you are looking for a centrally located resort in Riviera Maya, Excellence Riviera Maya is smack in between Cancun and Playa Del Carmen, so you are simply approximately 25 minutes from each of these areas. Set on a nice long beach, you can cab to Cancun or Playa Del Carmen quite easily, yet you get the atmosphere like you are far away from the buzz of the city or town. If you like nice pools, Excellence Riviera Maya has 6 meandering pools that run throughout the property. Another key feature that appeals to many couples travelling to Mexico, authenticity! Excellence has a modern look that is blended with real Mayan charm. From the Palapa style restaurant that anchors the main pool to a charming Mexican courtyard, you definitely know you are in Mexico. If you want plenty of dining options, Excellence has 8 international dining choices on site, including an Indian restaurant which is growing in popularity. If you are into spas, Excellence has one of the nicest spas in Riviera Maya. On my recent visit, I was again blown away by the 25 foot entry way arches/doorways that lead you into the sanctuary of the spa. Finally, if you are looking at staying under or at $3k (LAND ONLY, including transfers) for 7 nights and two adults, then you can do this at Excellence Riviera Maya. Depending on which city you are flying from, you can usually do the entire trip for around $4k. And Excellence is an all inclusive property, so all your meals and drinks (including alcohol) are included.